I've read two books over the last week. Once I finished up Tolstoy's remarkable Anna Karenina, I inhaled my next book in two sessions. It was a little bit of delicious nothing by Seth Grahame-Smith, the author of Pride and Prejudice and Zombies, the same guy who wrote the actually much-more-entertaining-than-the-movie Abraham Lincoln: Vampire Hunter. He does the historical twist mashup better than most souls I know. The book was entitled Unholy Night, and I was drawn to it by the premise, which was as follows: The wise men? They're actually wise guys, three crooks on the lam. They've stolen gold, frankincense, and myrrh from Herod, and are making their escape. I mean, what a premise. How could I resist? It ended up not quite working, though. It was well researched, steeped in the history of the region enough to give a sense of place. And it was well written, punchy, sharp, and playful. Grahame-Smith has a thoroughly enjoyable way with words. But it was too jarring, as he tried to respectfully juxtapose the sacred narrative of Christianity with a hack'n'slash bit of brutal pulp action. With a little magic thrown in for good measure. If I wanted to see a Jesus-themed bloodbath, I could just stream the Passion of the Christ. But it was readable, and a little fun, and almost infinitely less annoying than the other work of wild historical speculation that I'm heaving myself through this week. 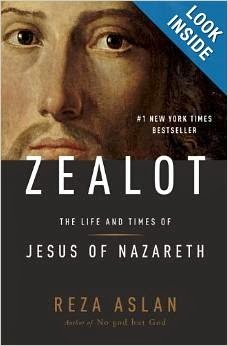 Because after reading Unholy Night, I got into Reza Aslan's remarkably successful Zealot: The Life and Times of Jesus of Nazareth. Number one on the New York Times Bestseller List, as it so proudly announces on the cover. As a pastor, I've been asked now about a half-dozen times what I thought of it, and I've said: wait until I've read it. God help me, but it's a terrible book so far. Terrible. The sort of book where I'm sitting there next to my wife in the evening while she clacks away on the laptop, and she says, "Honey, can you please stop muttering angrily to yourself. It's distracting." It's not badly written, mind you. He's a smart guy, with a good way with words. Nor does Reza have a weak grasp of Roman history. But his "Life and Times of Jesus of Nazareth" is such a preposterous fabrication that--as a pastor who thoroughly embraces the historical-critical approach to my own sacred texts--it boggles my mind. When Reza says that Jesus was a zealot, a peasant revolutionary bent on the violent overthrow of the powers that be, he's creating a Jesus out of whole cloth, one that has as much basis in history as the Abraham Lincoln who killed vampires as a sideline to his lawyering. He presents us with a Jesus who is peculiarly unrelated to any of the narratives of his life and teachings. Not just the canonical gospels of Christianity, mind you. This Jesus looks like nothing at all like any witness of any ancient tradition I've ever encountered in 25 years of undergraduate and graduate study. It's historical fiction, not history, the work of someone reimagining Jesus in a way that works with his particular worldview. But what is that worldview? For that, I'm going to have to blog a little further.